2017 has been one of NWDF LTD biggest years so far. Demand for our business increased dramatically, resulting in the purchase of three 7.5 tonne curtain siders and one curtain side Luton due to the needs of our new and existing customers. We waved goodbye to our warehouse in St Helens and said hello to our new home, a much bigger and customer friendly depot in Salford Quays. We are almost settled in at Salford, currently we are decorating our meeting room, which will be fully completed and ready for use once the final units are fitted in the coming days. 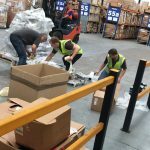 We will be using the Salford warehouse for Shipping and storage, and our office will be used for our Same Day and Shipping team. Our new Sameday delivery coordinator, Alan, has taken well to his new role, we had to take on 3 new 7.5tonne drivers for him. We have also had an increase in night routes jumping from 14 to 17 routes, this is the biggest jump we have had in a while for our nights team. This is where the other 7 new members are helping us, doing the deliveries and helping to keep our warehouse organised. In December NWDF LTD were lucky enough to be a drop off point for Key 103 Mission Christmas, this is a scheme that helps local underprivileged children have the best Christmas ever. To do this, we asked everyone we know to donate at least one toy that would then be passed onto a child. We were given so many donations, and fingers crossed we can take part again in December 2018.